When your mattress isn’t as comfortable as you would like, a mattress pad or mattress topper can add sleeping comfort, offering an inexpensive way to prolong the life of your mattress. Though the names are often used interchangeably, a mattress topper is thicker offering some combination of softness and support. A mattress pad is thinner and while it may be padded, its primary function is to protect your mattress. Cushioning and support – Different people have different support preferences and requirements. The degree of firmness can vary on toppers even within the same category. Breathability and body heat regulation – Some materials retain heat, others dissipate heat and let air circulate. Consider whether you and your partner are affected by sleeping temperature. Smell – Many foam mattress toppers can have an odor when new; most will dissipate in a few days. Low quality brands can have an unpleasant odor that lingers. If you are sensitive to odors, you may want to steer clear of memory foam or plan to air out your topper for a few days before you use it. Memory Foam – Comfortable and supportive. The thicker the foam, the more softness and support you will feel. These provide pain relief and last a long time. They can dampen noise. However, they are on the higher end of pricing, especially the thicker toppers. They can have an initial odor that should dissipate in time. Some can retain heat; others are infused or topped with gel to redistribute heat. Latex – Firm and supportive, usually indicate the level of firmness. These are comfortable and good for pain relief. They last a long time and are hypoallergenic. However, they are expensive and have a tendency to sleep hot, retaining heat. Down/Feather – Soft and fluffy, these are durable and good at regulating temperature. However they provide little support, and depending on the construction can require fluffing and redistribution of the fillers. Inexpensive options can have stiff feathers that can poke through the fabric. Cotton – Easier to clean and care for than other options can come in a range of softness and materials. They are more likely to provide softness than support. Pricing can vary widely from low to high end of the range. However, they are not as durable as other choices and will compress, losing their shape and comfort faster. Wool – Soft and comfortable. These are good at regulating temperature and last a long time. They tend to be in the mid to upper price range. However they tend to be denser than other options. To add extra softness to a mattress that is too firm – look for a topper that is thick, fluffy and soft. Featherbed, wool and cotton bed toppers are soft and fluffy. To help regulate temperature – look for gel infused memory foam, feather, or wool. It might surprise you to learn that wool mattress toppers are great at regulating temperatures; they sleep warm in the winter and cool in the summer. To relieve pain – if morning aches and pains are the issue opt for a topper that provides joint support such as high-density memory foam or latex. Two sleepers with different needs – if you cannot find a mattress topper that perfectly meets the needs of both sleepers, choose different pads for each side of the bed. This works well with king size beds because twin or twin/xl toppers will cover about half of the bed. For queen beds, foam mattress toppers can be easily cut to size. Continuous smooth surface – Be sure the topper continuous and smooth, without uncomfortable seams, not in pieces that might move around and without uncomfortable edges. Also look out for other comfort detractors like stiff feathers that can poke you. Washable cover – Quality mattress toppers have a removable cover that can be machine washed. Keeps its shape – Be sure the mattress topper will keep its shape and not stretch or require fluffing or redistribution of the fillers. Water resistant or waterproof - Choose a mattress topper that is at a minimum water resistant so that perspiration and fluids won’t soak in. For children, waterproof pads or toppers are essential. Once you’ve made your choice, consider the thickness of the mattress topper you are going to purchase. If you’ve selected a very thick topper you might need to invest in deep pocketed bed linens to ensure a proper fit. If you are simply looking to protect your mattress from wear, stains and liquids, or yourself from allergens, consider a mattress pad (also called mattress protectors). They are designed to protect your mattress and extend its life. Mattress protectors come with or without padding, but the padding tends to be minimal in comparison to mattress toppers. For best results, look for mattress pads that are waterproof to repel fluids and moisture. Though the padding and support on a mattress pad will be minimal, some do offer added benefits. For extra warmth in the winter time, consider a heated mattress pad. 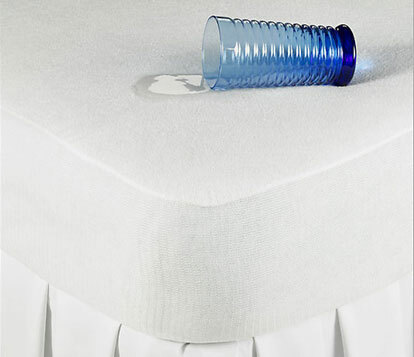 Many mattress protectors offer protection from dust mites and other allergens. There are also mattress protectors with bedbug barriers. These mattress pads encase the entire mattress and zip closed, rather than slipping on like a fitted sheet. If a mattress pad or mattress topper isn’t enough to improve the comfort of your bed, consider purchasing a new mattress. Our mattress guide is a great place to start your research.